Are You Sticking to Your New Year's Resolution for 2016? Home > Blog > Whole Home Remodeling > Scottsdale Home Remodeling: Are You Sticking to Your New Year’s Resolution for 2016? Scottsdale Home Remodeling: Are You Sticking to Your New Year’s Resolution for 2016? Was one of your New Year’s resolutions to finally move forward with that home remodeling project you’ve been avoiding? With spring right around the corner, the time is now to start making the commitment. 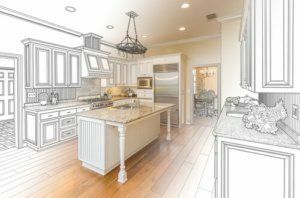 Scottsdale home remodeling trends can vary from year to year, especially when it comes to kitchens and bathrooms. This year, most designs are moving towards modern, sustainable functionality while others are promoting organization and storage. The kitchen is the heart of the home, and having enough space is crucial if you want to utilize it to comfortably cook for your family and friends. In recent years, spacious kitchens are becoming increasingly popular. Removing unnecessary walls and incorporating oversized islands are trending. One approach designers suggest to increase the space in your kitchen is to camouflage your appliances, such as your dishwasher or refrigerator, by making them seem like a seamless part of your cabinetry. The year 2016 is all about transforming your bathroom into a peaceful, relaxing retreat. If space allows, consider installing a walk-in shower or freestanding tub. Dual shower heads are also increasingly popular, as well as rainfall showerheads that stimulates a sense of rain falling onto your skin. Every year, different colors trend for decorators and designers. According to the Pantone Color Institute, the 2016 “Color of the Year” includes two: “rose quartz” (pastel pink) and “serenity” (a powder blue). Are You Ready to Discuss Your Scottsdale Home Remodeling Project? For every project, our goal at Republic West Remodeling is to deliver exactly what we promise. Transform your house into your dream home! Contact us today for the highest quality, luxury Scottsdale home remodeling.